Real carnauba wax + protective polymers = shiny, protected gel coat! Marine 31 Gel Coat Carnauba Wax + Sealant is the solution for keeping your boat looking new year after year. Salt from the ocean and intense ultra-violet (UV) rays from the sun cause the gel coat on boats to oxidize and yellow, hindering the shine from the underlying finish. This chalky, white residue is an eyesore that takes away from the overall appearance of your pride and joy. Protect your investment by applying Marine 31 Gel Coat Carnauba Wax + Sealant on a regular basis and keep your gel coat looking new and shiny! Marine 31 Gel Coat Carnauba Wax + Sealant combines the proven benefits of real carnauba wax and advanced crystalline polymers into one easy-to-use formula. The real carnauba wax imparts a high-gloss, slick finish while the crystalline polymers provide rugged protection against salt and UV rays. It�s only an added bonus that Marine 31 Gel Coat Carnauba Wax + Sealant is exceptionally easy to apply and remove, by hand or dual-action polisher. Don�t stop at the gel coat! Marine 31 Gel Coat Carnauba Wax + Sealant can also be applied to aluminum and stainless steel surfaces. Regular application will make treated surfaces easier to clean and maintain. For best results, polish your boat with Marine 31 Final Step Polish to remove any light oxidation or surface staining. 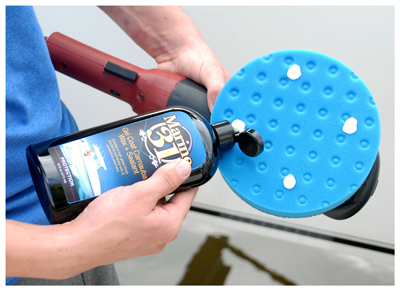 If the boat is heavily oxidized, use the Marine 31 gel coat polishing system to restore the shine and luster. 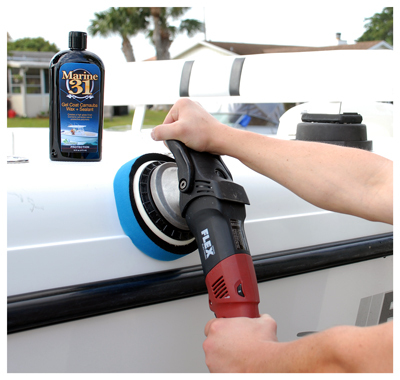 Marine 31 Gel Coat Carnauba Wax + Sealant is harbor-safe and eco-friendly. Shake well. Do not apply to underfoot surfaces. Apply a nickel-sized amount of product onto a soft foam pad and spread evenly over surface. Maintain the shine and protection with Marine 31 Gel Coat Spray Wax Plus. Marine 31 Gel Coat Carnauba Wax + Sealant 32 oz.